Huntington Beach. 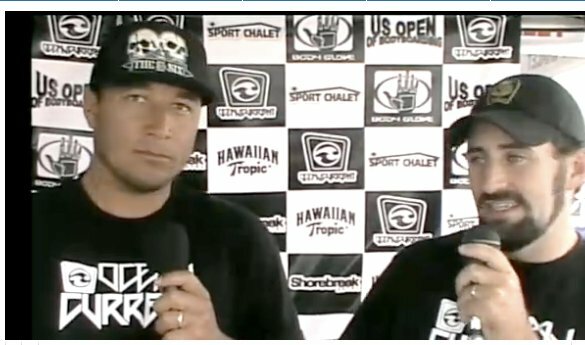 Last weekend, myself and Steve ‘Action’ Jackson MC’ed the Sport Chalet US Open of Bodyboarding. So we had front row seats to the one of the most intense comps in recent history. Me thinking and Action talking. The action started with the cool idea of Sport Chalet’s Sports University concept. On Thursday, companies were invited by Sport Chalet to set up a pop up tent at Beach Blvd and demonstrate and talk about their products to the employees that showed up. Guinness! I got to see a bunch of old and new friends and I actually had to go out and demo my bodyboard for a couple Sport Chalet buyers. Good times. Mike Stewart and the Hawaii groms on hand for Sports U.
Friday, was more of a hype day. 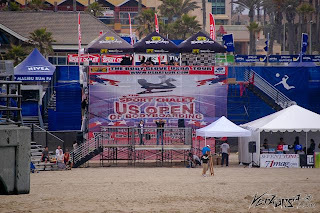 I was on the mic on the massive scaffolding on the south side of the HB pier promoting the weekend’s event and sponsors. Saturday saw good 2-4 foot waves for competition. The first rounds of all the divisions were sent out and weeded out the competitors. I was putting my money on the South African ripper, Wesley Fisher, but was later knocked out in the semi-finals. The amateur divisions were dominated by the Hawaiians. How they were able to wear spring suits in 63 degree water after coming over from the warm Hawaiian waters is beyond me. Early Friday morning. The set up is ready. 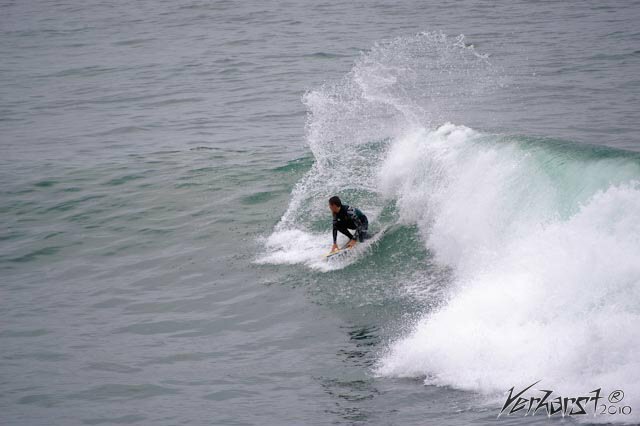 Sunday showed remnants of the fading south swell but was still pushing 4 foot sets through the contest area. The women’s pro division saw international riders tearing it up all day long. It was Karla Costa-Taylor take the win hands down. Claudia Ferrari was close on her heels but couldn’t pull it off in the last minutes of the final. The amateur division was far from it. 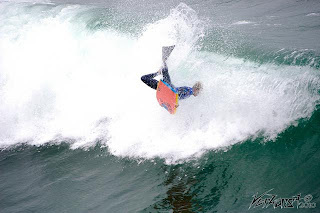 The new generation of bodyboarders were holding their own and showed positive outlooks for the future of US bodyboarders. California super grom, Rocket Klein, was on fire and was putting in some serious water time to compete with the Hawaiians. In the end it was Trevor Kam and JB Hillen that took the Amatuer and Amatuer 13-18 divisions, respectively. Side Note: It was JB Hillen’s birthday on Sunday and this was his first time on a plane and actually leaving the west side of Oahua! Oh cuz! DK divisions are always fun to watch. Cali rippers, Jeff Bragg, Joe Grodzen, Nick Ashby, Matt Hamilton, Jeff Vycital and others were out to win. Wave selection was the key in all the heats. We all know that every DK rider has the skills to take the win but it all came down to wave selection. Joe Grodzen was on fire and was hopeful to give David Hubbard a run for his money. But Joe, along with Bragger and Ashby, were knocked out. In the final it was the three Hawaiians, Mich Mickmullen, David Hubbard and the lone Cali boy, Jeff Vycital battling out for the title. In the end, David Hubbard, pieced together another win to add to his list of victories. David Hubbard throws some chunks. (Copied from usbatour.com) The Men’s Pro Final provided the riders with a spitting south swell and good ramps. 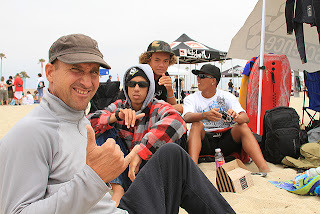 It was the Kauai rippers Jeff Hubbard, David Phillips, and David Hubbard battling against Maui charger Jacob Romero. They were all going hard with style, and giving the judges a reason to pay attention to the water. David Phillips and Jeff Hubbard both took waves back to back, throwing synchronized moves; it’s like they were in each other’s heads. But the highflying Jacob Romero proved himself throughout the heat to be the best, by cruising with style and consistency. Romero scored the title for the Men’s Pro 2010 USBA Champion! Jeff Hubbard throwing out the ARS move. Check out www.usbatour.com for more on the event. Jacob Romero wins the US Open Of Bodyboarding. Up Next: Info on the new FFATtrip: SUP Mex. SUP Adventures in Northern Baja.